A whole lot of the appeal of Bar Marsella in Barcelona is that walking through its doors is like taking a step back in time, into an old Belle Époque painting of some run down sordid place occupied by equally as sordid looking figures drinking alone. So in other words, it’s wonderful. Just as wonderful is the drink that Bar Marsella specializes in. Like most alcoholic liquids, absinthe got its start as an all-purpose medicinal remedy. And, like most alcoholic liquids, it soon became a medicine of a different kind, finding favor with French soldiers fighting in Algeria, and later, French citizens of the mid-to-late 1800s. So popular did the drink become in France during this time that 5pm became known as l’heure verte, or “the green hour,” with its consumption jumping from 700,000 liters in 1874 to 36 million liters by 1910. Because of its popularity it was soon mass produced, which meant it became cheaper to drink – a calling card for the starving artist. A glass of absinthe is as poetical as anything in the world. What difference is there between a glass of absinthe and a sunset? Translation: Drinking absinthe is like drinking a sunset. If nothing else experiencing a glass of absinthe at Bar Marsella, in addition to being a very unique and easy way to get drunk, is a great way to sample a bygone era. By 1915 absinthe was banned throughout much of the continent, as well as the United States, on the premise it was a dangerous hallucinatory drug. In the end this proved false. Thujone, a neurotoxin found in the wormwood plant used to make the drink (absinthe is French for “wormwood”), is only present in trace amounts, not nearly enough to have any effect. More than likely if people were seeing things from drinking l’absinthe it was because they were belligerent or what they were drinking was cheaply adulterated with other harmful substances, which was very common around the early 1900s. It turns out all those crazy artists who supposedly went mad from drinking absinthe were just plain crazy, alcohol or no alcohol. Nowadays one can readily find absinthe and advocates of it swear that while it may not make you see things, it does produce a markedly clear-headed, lucid-like drunkenness better than your average drink. But drinking absinthe isn’t so much about getting hammered as it is getting lost in its nostalgia and ritual. This is why I am fond of Bar Marsella. With its peeling ceiling, dust covered chandeliers and old beaten wobbly tables, it complements the experience of drinking absinthe perfectly. 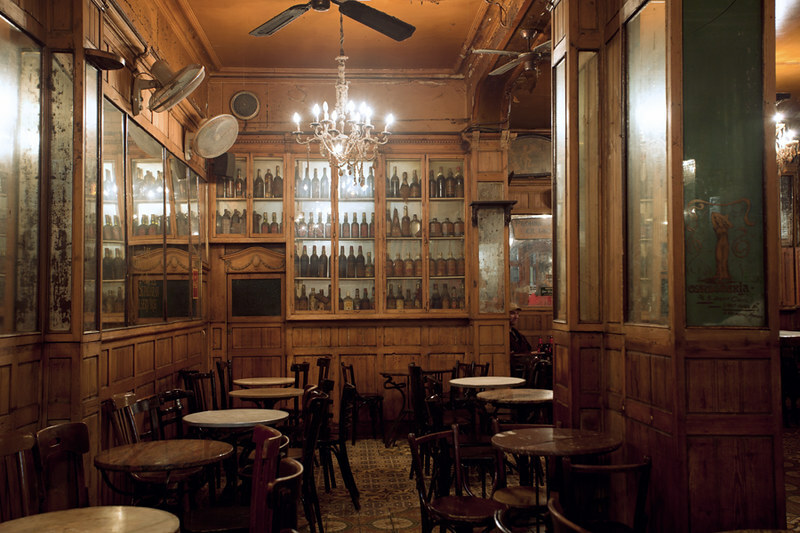 Barcelona’s oldest bar is today the decaying mecca for an authentic glass of this mythic drink in all its maddening glory. A place where one can sit, sip and pretend to hallucinate beside the great artistic ghosts of the past.